Visual Basic has been modernized with new, richer object models for data, forms, transactions, and almost everything else. The file formats have also changed. Projects from previous versions need to be upgraded before they will compile and run in Visual Basic .NET. The Upgrade Wizard handles much of this work, but most real-world projects will require additional modifications before they can be run. This is where this book come to address. 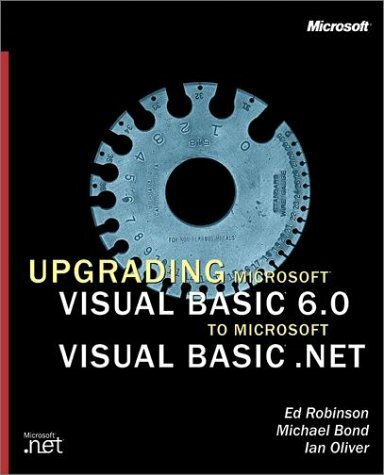 It is is a complete technical guide to upgrading Microsoft Visual Basic 6 applications to Microsoft Visual Basic .NET, covering all aspects of upgrading from APIs to ZOrders. This book includes chapters on fixing upgrade issues with forms, language, data access and COM+ Services. It also shows how to add value to upgraded applications with XML Web Services, ADO.NET and .NET remoting. It shows global architectural advise, and includes a reference of function and object model changes from Visual Basic 6. 'Introduction to Programming in Visual BASIC 6.0' gives a careful and accessible introduction to programming in BASIC for the student wanting to understand what programming is all about and what programs like Excel are doing. by Matthew MacDonald - O'Reilly Media, Inc. This practical book offers nearly 50 hands-on projects. Each one explores a new feature of the language, with emphasis on changes that can increase productivity, simplify programming tasks, and help you add new functionality to your applications. The book covers everything needed to get up to speed with Visual Basic. The text includes the installation of Visual Studio, variable types, flow control, string manipulation, database access, form designing, graphics, arrays, and much more. This book is written from a Visual Basic 6.0 perspective. It covers many different techniques and topics including optimization of programs, object oriented programming and coding guidelines, Windows API, VB6 command reference, and much more.